Food tastes best when eaten outdoors. It does. It’s what many of us know as a backcountry truth. 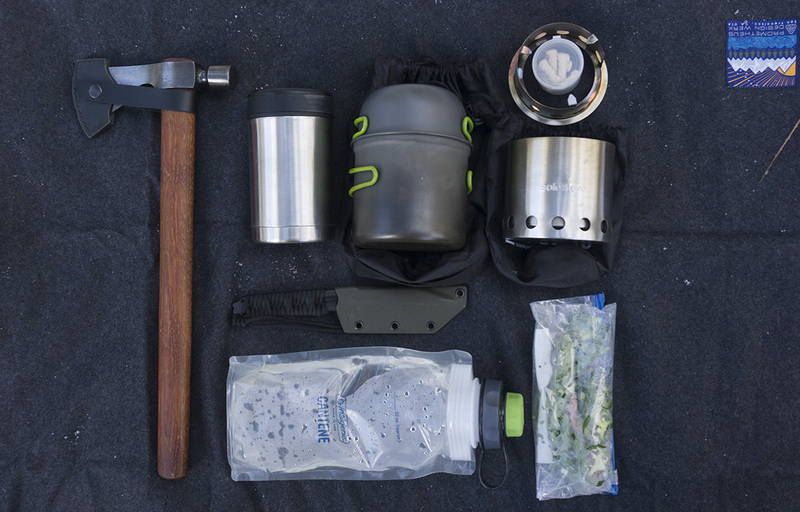 If you’re overlanding or enjoying vehicle supported camping, the camp kitchen is typically afforded a larger array and variety of supplies, utensils, ingredients to food stuffs. You can achieve a rather high degree of gourmet cooking in these circumstances. This article will focus on a more person-carried, backpacking-centric recipe and preparation for one of our favorite meals, the Vietnamese noodle soup known as pho. Note that this is our best approximation of this dish in a backcountry context. While we will describe our recipe with a number of fresh ingredients, our dish is field expedient and is not intended to go toe to toe with a culinary purist’s definition of a regional Pho dish served at a sit down table. That said, most pho fans who backpack will find this a very tasty meal while in the wilderness. Before we begin, we can acknowledge the many readily available freeze dried, quick prep backpacking food options that have been on the market for decades. Literally “just add [hot] water” into these foil coated plastic packets, stir, wait and eat. The taste and menu selection for these vacuum sealed food packets have certainly improved over the years. Some are actually pretty good, some are more on the meh side of things, and for some an acquired taste. For backpackers on 5+ day trips to alpinists where an ability to cover greater distances and lighter weight loads are very important considerations, these freeze dried meals are quite often the standard fare. Compact, low weight, easy prep, and calories to keep you going. Some downsides of freeze dried backpacking meals are a growing desire for “fresh” food after a few days, being too salty is a common criticism, and for some the wish for your gassy tent mate to sleep outside. For those of you who are looking for an alternative to the freeze dried pre-packs and are DIY capable, I will walk you through a backpack friendly, trailside meal that is low cost, easy to prep and a fresher tasting break from the norm. This dish is best eaten in the first two days out in the backcountry due to the nature of the fresh ingredients. Many parts of the US now have grocery stores that offer a wide variety of international foods. In the California Bay Area and many other cities, an Asian-centric store can be found. For around a dollar and some change per package, any number of imported Asian-style packaged instant noodles are available. These are different than familiar Top Ramen® variety, and are instant in the fact they do not require any “cooking”. Like the freeze dried backpacking pre-packs, “just add hot water”. Unlike the freeze dried foods, you do not end up with an unrecognizable mash of flavor in a bag. Over time, numerous trips to the grocery store, and taste testing, here are a few instant noodles that we like after a few rounds of trial and error. These are all rice based type noodles. 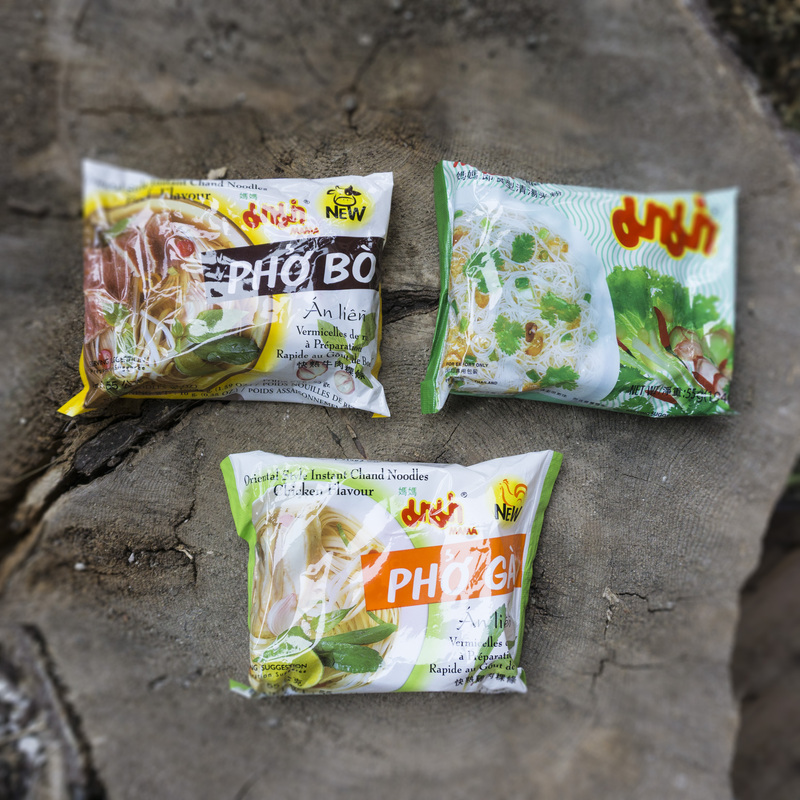 The two with “Pho” on the packaging are based on the Vietnamese noodle soup of the same name, and the “Bo” and “Gha” indicating beef flavor and chicken flavor respectively. The package of noodles with the unrecognizable title pictured was something we landed on by trial and error, we’ve tasted tested, and by reading the back learned it has the same 3 minute hot water steep time as the pho variety shown. We mentioned it here as it allows a wider variety of proteins and add-ins to be added, and yields a more general “Thai” flavor. We like it because it’s easier to mix and match add-ins with this style noodle if you don’t happen have the ingredients more apropos for the pho styles. Again, all these instant noodles “cook” by simply soaking in hot boiling water for 3 minutes in a small covered cookset pot or container. The key to this entire dish is the DIY pre-prep. You’ll need to use pre-cooked beef or chicken before hitting the trail. We use anything from sliced leftover rib eye steak or roast, to shredded roast chicken breast. Put meat into a ziplock baggy and freeze it overnight. Slice Jalapenos and green onions, and a few sprigs of fresh cilantro and bean sprouts (mung bean) to your liking and set aside. If you want to go the extra mile, bring a slice of lime. Not typical to Pho, but I added a few sugar snap peas to our recipe. They have a great crunch, flavor and stay fresh for days. The morning before getting in your car or shuttle to the trailhead put in the fresh greens in with the frozen meat, wrap well in the ziplock or even make a mini vacuum seal pack. Place in the middle of your backpack to keep cool for for as long as you can. Freeze dried green onions and cilantro. Our favorites are from the herb brand Litehouse Foods. Vacuum packed vegetarian soy “meat slices”. Many brands out there, try out a few and pick one that you like. Bring an uncut lime and Jalepeno pepper to cut and use at time of field prep. Sugar snap peas if desired as these will last and stay fresh for more than 3-4 days in mild temps. Skip the bean sprouts as they won’t last beyond 2 days in our experience, especially when the weather is warm. You can replace with a carrot to julianne for a nice crunch and fresh taste as an alternative. With this selection of these latter ingredients, you can extend this dish to prep out 3-4 days. Longer if you are winter camping. The day and conditions of this field food demo was during the winter, 4100’, and 27º at 1300 hrs. Any number of backpacking style of stoves can be used to boil the water needed to make this dish. To keep my wilderness skills honed, I opted to use a Solo Stove, which burns wood and is my favorite biomass fuel backpacking stove. Because this was a winter run for this dish, I also brought along a 17oz, double wall, stainless steel vacuum food container to prepare this meal in. It keeps everything hot, and longer, especially while eating. I used an Isosteel brand food container, which is FDA approved, BPA free and boasts ‘approved for use from the German Bundeswehr”. This well made and affordable double wall container was purchased from amazon for $12 delivered, at the time of this article. During warmer weather, preparing this dish in your stove cookset pot works just fine. I typically carry a small camp hatchet or tomahawk and my PDW Griffin Pack Knife to prepare wood to use with my Solo Stove. Sure, this whole process takes longer than using a liquid or gas fossil fuel stove, but I enjoy this aspect of time in the field where I can practice my competency in fire starting and using wood as fuel. Please note where you are hiking/camping and whether or not you can collect downed wood or cut your own. Some areas may require a permit to use a stove, have a fire or cut wood. If you wish you can bring a few pieces of precut “kindling sized” wood, which takes up little room strapped on the outside of your pack, and in my case I also used the unburned kindling as a base for my stove on the fresh snow on the ground. It’s always a good idea to have matches and/or a Bic lighter in your pack. It is the easiest manner in which to start a fire. Some type of tinder of your choosing either store bought, or DIY is very helpful, unless you really want to try your fire starting skills with found materials in a snow covered winter environment. I opted to start up my stove fire somewhere in between without using a match or lighter, but using tinder, a one-handed sparking unit and kindling to cut when setting up. Setting up this trailside meal while sitting on top of my PDW Technical Picnic Blanket with my pack and gear laid out kept me off the snow covered ground and a nice area to kick back on. Of the many wood burning backpacking-survival stoves I’ve used, the Solo Stove is by far my favorite. It is very well made, easy to set up, use, and burned cleanly and efficiently. It all nests perfectly inside my cookset. I really like how you can feed the stove with wood without moving the pot once it gets going. It is a smart, simple design. I used the Pho Bo instant noodle package for this demo and brought along some leftover sliced ribeye steak with my other ingredients. As it was in the high 20s during this day out, all my pre-prepared food stayed cold. Some of the meat was actually still frozen. I poured about 400ml of water into my cookset pot (the instructions on the back of the noodle package calls for 350 ml or about 1.5 cups, but I like a little extra water to use for clean up) and placed on top of the Solo Stove to boil. I then placed the noodles, included flavor packets (this where I like how you can choose how much of the flavor packet to use and suit to taste) and DIY add-ins inside the stainless food container. The 17oz container size fits all the ingredients with hot water just about perfectly. While taking my time and preparing this meal, I was feeding the stove with wood to keep the fire burning. All said and done, it took about me about 7 minutes to notice the steam from the boiling water. Once the water was boiling nicely, just pour into the stainless double wall container and then screw the lid pack on. Since it was 27º out this day and the ribeye was still a bit frozen, I opted to wait 4 minutes instead of the instructed 3 minutes for the meal to steep. I wouldn’t recommend steeping for more than 4 minutes otherwise you may end up with mush instead of nice noodles. The vacuum container was definitely a plus for the colder conditions and kept everything nice and piping hot at the end of 4 minutes and also while I was eating. It was nice to keep the stove going for a little longer as company while I chowed down on the pho. The fire also kept my extra water hot I had leftover in the cookset pot to rinse off my cookware after I finished eating. A hot bowl of pho on a cold day in the backcountry definitely hit the spot. 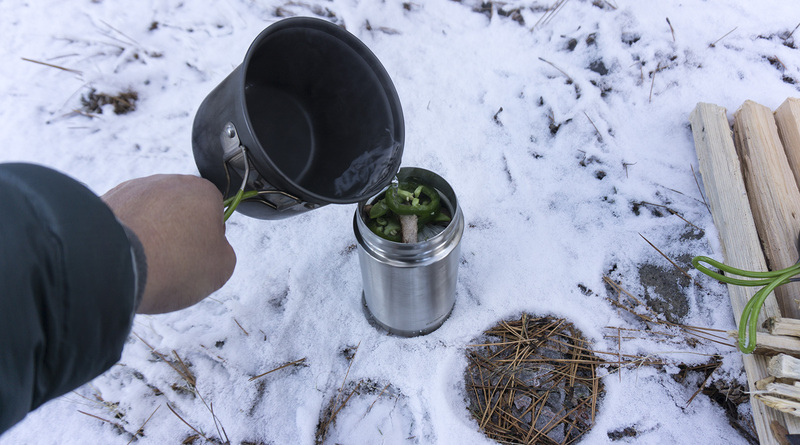 Anyone who has camped out or bivouacked in the winter knows how quickly hot food can get cold in a normal bowl or cookset pot. 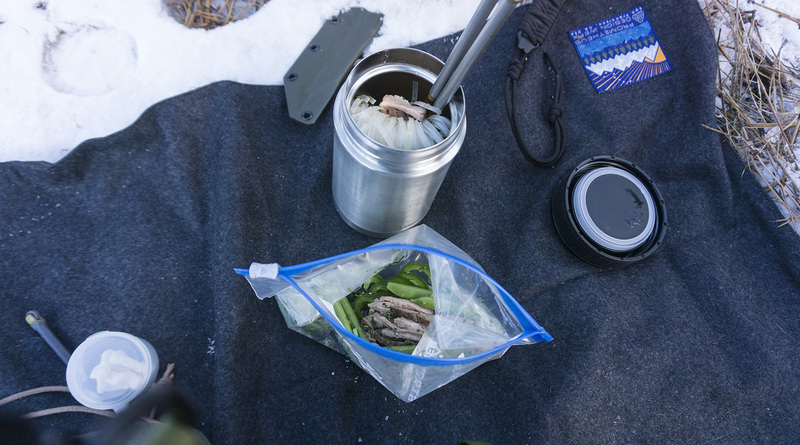 Using a double wall container kept the food hotter longer in these colder conditions and made for a really great trailside meal. Taking a little time to try out new DIY dishes in the backcountry can really expand your camp menu. You don’t have to always be stuck with the same, tired old freeze dried chili mac or beef stroganoff in a bag as a hot meal when hiking or backpacking. This is just an example of what you can do to experiment and come up with some fresh alternatives to your meals in the field. Our Field Pho can easily be rotated into your overlanding menu as well for the times when you may not want to spend as much time preparing something more elaborate even if you can. Variety is the spice of life and when it comes to eating in the backcountry and adding this dish to your line up may be a very welcome and easy to make change up. *Please remember to always take care when making and using fires in the wilderness. Extinguish all open flames and embers properly. Pack out what you pack in and leave no trace. Live wild, wise and free my friends! Otter (Lontra canadensis) the North American River Otter thrives in water, land, and snow and considers all these places his stomping grounds. He believes that the best meals are enjoyed outdoors, welcomes any challenge that comes his way and turns it into fun. He is highly adaptive to the aquatic environment having webbed feet and a swimmers body, and ears and nostrils that shut when diving. His thick fur coat keeps him warm and water-repellent in and out of the water year round. Otter aka Patrick Ma is the Founder of Prometheus Design Werx and the Chief Danger Ranger at DRB. Patrick has been active in the wilderness his entire life and spent most of his youth in the mountains of Pennsylvania and Upstate New York. When not designing and developing new products for PDW and DRB, he can be found using them somewhere in the Californian backcountry with his wife and two otter pups. Great tip about the Litehouse herbs! I love pho for backpacking (as well as for everyday life) but never thought to add Litehouse cilantro. Will give this a try very soon–thank you. I buy an instant pho broth mix from the local Asian food store. It has most of the spices and flavor of Pho broth. Then I add everything you add. Do not forget the Siracha.